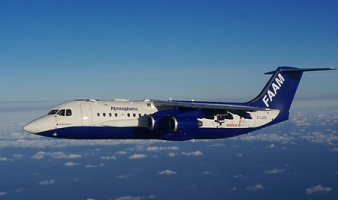 CLARIFY-2017 will deploy the modified BAe 146-301 large Atmospheric Research Aircraft (ARA) facility to the SE Atlantic for performing in situ airborne measurements and, with supporting ground-based and satellite measurements, this data will help constrain radiative transfer and climate modelling simulations. 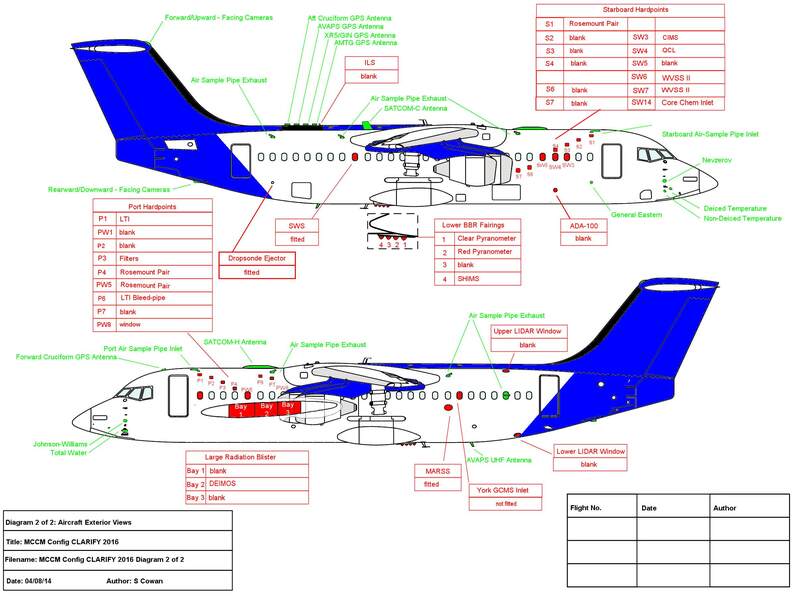 The sections below give details about the instrumentation aboard the BAe-146 aircraft and describes the ground-based and satellite instrumentation that will be exploited. The main experimental platform will be the FAAM BAe 146-301 aircraft (pictured right), which is jointly funded by NERC and the Met Office. The aircraft will be based in Walvis Bay Airport, on the coast of Namibia, which has an optimum location for the study of BBA and stratocumulus cloud. The FAAM aircraft will be equipped to maximise scientific measurement capability of aerosol-cloud aerosol-radiation interactions. A high duration of over 5 hours flight time will give a range of around 2000 – 3000 km depending on altitude. CLARIFY will involve a total of 125 hours flying time, of which 80 hours are in theatre science hours. A summary of the instrumentation is provided in the table below, while the locations of instrumentation aboard the aircraft are described in Figures 1 and 2 below. Scanning Mobility Particle Sizer (SMPS) University of Manchester Size resolved number: Sizes particle in the diameter range 10 – 500 nm based on particle electric mobility. Click here for more details. Dual Column Cloud Condensation Nuclei Counter (DMT CCN-200) FAAM Measures the number of CCN in a sample for a given set point supersaturation.Click here for more details. Samples through a Rosemount inlet on the port side of the aircraft. CVI Passive Cavity Aerosol Spectrometer Probe Met Office Size resolved number: 0.1 – 3.0 micrometer diameters. Samples through a Brechtel inlet. CVI TSI 3025 Condensation Particle Counter Met Office Total number of residual particles > 3nm Samples through a Brechtel inlet. EXSCALABAR Passive Cavity Aerosol Spectrometer Probe Met Office Size resolved number: 0.1 – 3.0 micrometer diameters. Brechtel Counterflow Virtual Impactor (CVI) Met Office / NCAS Aerosol residual chemical composition. Brechtel 1204 Inlet. Compact Time of Flight Aerosol Mass Spectrometer (ToF-AMS) University of Manchester Size resolved nonrefractory 4 – 700 nm aerodynamic diameter. Aerosols are drawn into a vacuum chamber through an aerodynamic lens, which focuses particles between 30 and 800 nm into a tightly collimated beam. The particles impact on a tungsten surface, heated to 600 °C, which causes them to flash vaporise. The vapours are then ionised by 70 eV electrons and then analysed by mass spectrometry.Click here for more details. Single Particle Soot Photometer (SP2) University of Manchester Single particle soot detection by laser induced incandescence. This instrument measures the soot content in individual airborne particles, in the size range 200-1500nm, and is sensitive to soot mass in the range of 1 – 300 femtograms per particle. Click here for more details. Volatility Aerosol Concentration and Composition (VAAC) University of Leeds Size and volatility resolved particle number PCASP (0.1 – 3.0 micrometers). Filters University of Manchester Sub and super-micron nucleopore. Click here for more details. TSI 3563 Nephelometers FAAM Scattering coefficient at 450 nm, 550 nm and 700 nm wavelengths. Click here for more details from TSI website, or here for theory of operation from NOAA website. Radiance Research Particle Absorption Soot Photometer (PSAP) FAAM Absorption coefficient at 520 nm. The instrument draws in air across a filter where particulate matter is deposited. The transmittance of a green LED light source through this medium is measured and compared to a reference cell, where the same light source is passed over the filter with no aerosol deposition. Click here for more details. EXSCALABAR photo-acoustic spectrometer (PAS) Met Office Dry and thermally denuded abs coefficient at 405, 515 and 660nm. Sensitivity: ~1 Mm-1, Accuracy: ~10 %. EXSCALABAR photo-acoustic spectrometer (PAS) Met Office Extinction coefficient at 405 and 660nm, under dry, 75% and 90% RH conditions. Sensitivity: ~0.5 Mm-1, Accuracy: ~5 %. DMT Cloud Droplet Probe FAAM Measures droplet sizes over the (nominal) range of 3µm to 50µm and liquid water content at 1 Hz. Click here for more details. Wing Mounted. DMT Clouds aerosol and precipitation probe (CAPS CIP-15, CASPOL) NCAS Size resolved number: 0.5 to 960 μm diameter, 1 Hz. Wing Mounted. SPEC 2D-S cloud-drizzle spectrometer (2D-S) University of Manchester Size resolved number: 10- 1280 μm, 100 Hz. Wing Mounted. SPEC FCDP/FFSSP (ultra-fast cloud droplet spectrometer) University of Manchester Size resolved number: 1 – 60 μm, 50 Hz. Wing Mounted. Cloud Imaging Probe-15: CIP-15 FAAM Size resolved number: 15 – 960 μm diameter, 1 Hz. Click here for more information. Wing Mounted. Leosphere lidar – EZALS45 Met Office Backscattering lidar at wavelength 533 nm (UV), with depolarisation. Shortwave Hemispheric Integrating Measurement System (SHIMS) Met Office Spectrally resolved irradiances over wavelength range 300 – 1700 nm at 3 – 6 nm resolution. TEi43C FAAM SO2. ±0.1 ppb @ 60s. Total Water probe Met Office Total water content, 64 Hz. WVSS-II: Water vapour Met Office Water vapour content, 0.4 Hz. Dropsonde systems FAAM Profile of temperature, humidity, wind-speed and direction. AIMMS Met Office 3-D winds, 20 Hz. Turbulence probe FAAM 3-D winds, 32 Hz. 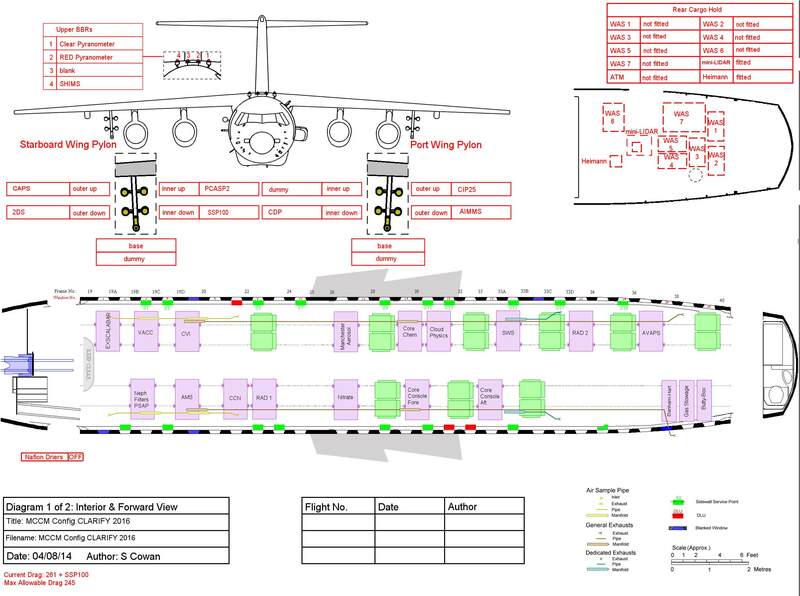 Figure 1: schematic showing the configuration of the external ports of the BAe 146 aircraft. Figure 2: top panel – configuration of instruments mounted on wing pylons; bottom panel – configuration of internal instrumentation, inside cabin. A limited surface-based deployment will consist of a GRWS100 Campbell automatic weather station (1.5 m temperature, humidity, wind-speed and direction, solar radiation, precipitation), halo-photonics eye-safe Doppler lidar (3-D wind-speed, aerosol and cloud), TSI-Dusttraks II aerosol monitor (PM1, PM2.5 and PM10 sampler), CIMELS 6 channel sun-photometer and passive deposition traps. Installation at Walvis Bay will ensure synergy with the aircraft profile ascents/descents on take-off and landing. This instrumentation will be augmented by surface based instrumentation from the Observational Based Research Department of the Met Office (project partner). A further surface site including CIMELS and lidar instrumentation at Gobabebb ~50km inland will be provided by NWU and LISA (project partners) where clear-skies predominate. Geostationary (Meteosat-10 and 11) satellites will provide standard operational SEVIRI cloud products via the Met Office (project partner). Data are available at 15 minute resolution and provide essential observations for optimally locating the aircraft. Aerosol retrievals derived from cloud-free regions from SEVIRI, MODIS and MISR will be used for (a) directing the FAAM aircraft to areas of high AOD and (b) for measuring aerosol properties, with the FAAM aircraft in-situ measurements providing validation of assumptions used in the satellite retrievals and estimates of uncertainty in retrievals. The CALIPSO lidar will provide an independent observational estimate of the relative vertical profile of aerosol and cloud and identify areas where BBA is in close vertical proximity to underlying cloud. Under-flying the CALIPSO overpass using the FAAM lidar to provide ~100 m resolution vertical aerosol profiles and cloud tops will allow inter-comparison and validation of the coarser spatial resolution CALIPSO retrieval algorithms. Retrievals of AODs from these instruments have been successfully challenged and validated in previous measurement campaigns, such as AMMA-SOP-0 for mixtures of mineral dust and BBA. Next-generation satellite instruments are scheduled for launch in 2015-2016 (ATLID lidar and MSI imager on EarthCARE, polarised imager 3MI aboard Sentinel 5) and will require aircraft data in validation of aerosol and cloud retrievals. Strong links with satellite research groups will ensure that the FAAM measurements will be assessed through very active collaboration.